Each batch specially made…just for you! 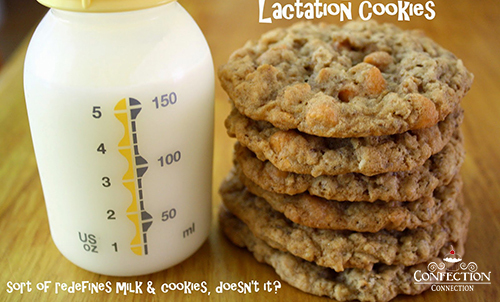 Lactation Cookies Can Help Increase Milk Supply in Breast Feeding Moms! If you’re having trouble breastfeeding, you are not alone. As many as 92% of first-time moms have issues, according to a Pediatrics study. Along with soreness and trouble getting the baby to latch, low milk supply is one of the most stressful concerns for new moms. But many women swear that a special cookie (and we love cookies) can work miracles. 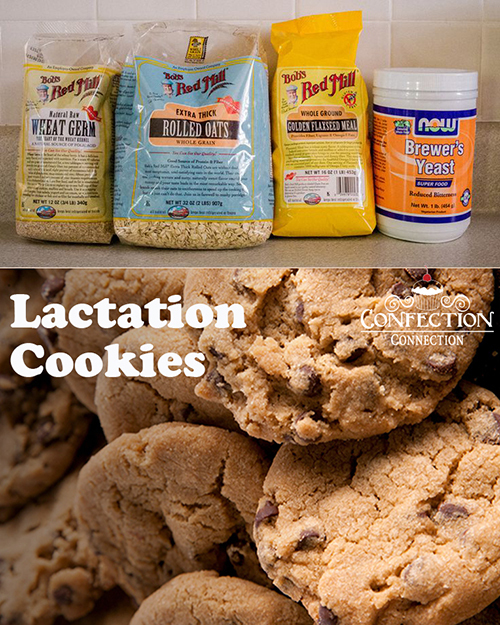 And Clarissa Woolard, owner at Confection Connection, developed the best lactation cookie on the market! “When I had my boys, I had trouble with low milk supply, so of course, being in the baking business, I went to work to make a great tasting, effective lactation cookie for myself and my friends. Then people from all around started hearing about it and it just took off from there”, says Clarissa Woolard, owner of Confection Connection. “Lactation cookies” have been around for a long time, but searches for recipes like “Miracle Milk Cookies” and Coconut Chocolate Chip Lactation Cookies have grown by leaps and bounds over the past few years. And the lactation cookies often rank among Pinterest’s top “moms” searches. Most of the recipes include four ingredients, each of which is touted for its milk-boosting properties: Oats, fenugreek, flaxseed meal, and Brewer’s yeast. Let’s start with Oats. They contain a high concentration of saponins, an immune-stimulating ingredient that helps increase levels of prolactin, a key hormone for milk production, vital for breast-feeding moms. Oats are also packed with protein, vitamins, and minerals, making them a healthy choice regardless of whether or not you’re nursing. Then you have Fenugreek. You will hear about this ingredient a lot for new moms wanting to increase milk production. The seeds of this plant are rich in phytoestrogen, a compound that helps your body balance your estrogen levels, which in turn helps regulate prolactin levels for optimal milk production. Fenugreek also enhances perspiration, which triggers your body’s letdown reflex, to release milk. The fourth key cookie ingredient is Brewer’s yeast. While there’s no conclusive evidence that this yeast increases milk supply, it is chock-full of B vitamins, and the trace minerals chromium and selenium. B vitamins may be particularly important for nursing moms since “they’re involved in many of the body’s processes,” Woolard explains. If you are reading this, that means you are probably searching for a great cookie to help you out. First, Congratulations on your newborn and second, we hope you enjoy an order of Lactation Cookies from Confection Connection. Order your Lactation Cookies today!